My grandmother hailed from County Mayo in Ireland. Her last name was Walsh. Nana sailed to Boston at the age of fourteen. Most of the other passengers were cattle. “We sailed in the Year of the Crow,” she told her grandchildren in her lovely Gaelic accent. “When was that?” I asked to pin down her age. Women from the West of Ireland were experts at keeping secrets, however that ocean voyage was so traumatic that she never returned to Ireland. Every year my mother and her sisters offered to fly Nana to Shannon. She was adamant with this decision and avoided any sight of the sea. In the summer of 1958 my older brother and I regularly stayed at Nana’s house in Jamaica Plains to give my parents a break from taking care of six children. 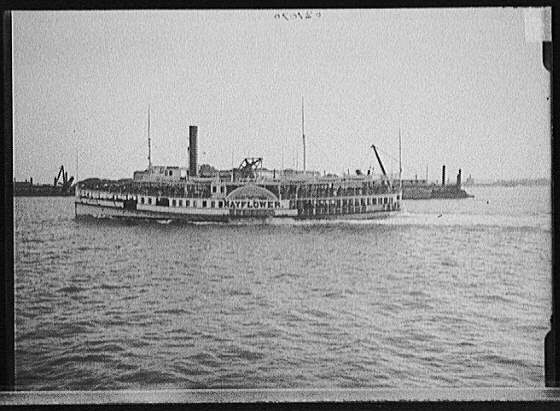 One weekend my parents proposed Nana taking the ferry to meet them in Nantasket. They were taking our younger siblings to a church event farther down the South Shore. Her other daugthers were bringing their children and Nana loved us all. “The bus will take hours,” said my mother. “Thank you,” my mother hugged hers and they left with my brothers and sisters for our home under the Blue Hills. The next day was hot day and we looked forward to the swim in the cold green Atlantic. The three of us rode the train from Forest Hills to Haymarket and then walked to Lowe’s Wharf. The pennants on the SS Nantasket flapped in the light breeze. The harbor water was calm and not a single cloud lay on the seaward horizon. “Looks like a fine day for sailing,” the purser said taking our tickets. Nana sat us inside the steamship. 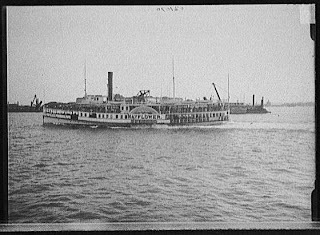 The ferry left on time and the sea breeze cooled the hundreds of the passengers. A clown prowled the lower decks to entertain the children. He had a funny wig and big floppy feet. My brother and I were scared by him and we kept our distance. The trip was scheduled to last about 30-40 minutes and our passage was uneventful through the inner harbor, however when we cleared Georges Island, the wind picked up under a darkening sky. Waves soon smashed over the bow. No land voyage can prepared landlubber for the methodical quivering of steel slapped by an angry sea. The SS Nantasket crashed through a beam sea tottering with 50 mph gust..
Nana was white and clung to my brother and me, while the clown and scores of children slid across the tilting deck. “Was your trip on the Atlantic this bad?’ asked my brother. He was as scared as me. She unleashed a mournful moo. “And people were lost?” My brother gaped at the waves crashing over the hull. “Cows only. Thank God,” Nana muttered a prayer and pulled us close. Several minutes later the storm ended faster than it began and we landed at Nantasket on schedule. My mother wstood outside the Waiting Station on the pier. “Say nothing,” Nana said walking down the gangplank. The Irish knew how to hold their sand. “How was the trip?” asked my mother, seeing the abating panic in the eyes of the other passengers. Nana spent the afternoon in the bandshell. Her feet didn’t touch the beach. She was glad to leave Nantasket and even happier to arrive back to Jamaica Plains. It was far from the wicked sea. She kissed us good-night. “It was a fine day for sailing,” I told her. Nana had a way with words, but an even better one without words. Her kiss was my ticket to dreamland and none of those dreams involved the ocean. Maith á aithne agam uirthi. This entry was written by Peter, posted on August 18, 2017 at 11:17 am, filed under 60s, boston, family, sea, semi-fiction, youth and tagged ferry, ireland, jamaica plains, nantasket beach, paragon park. Bookmark the permalink. Follow any comments here with the RSS feed for this post. Post a comment or leave a trackback: Trackback URL.